Collective Blog: Pakistani politics: Where are the women? The launch discussion brought up the numerous challenges facing Pakistan’s young democracy and the growing anticipation surrounding the general elections scheduled for next year. Participants joined in to share their experiences and ideas for how best to strengthen the electoral process and bring women’s voices in more effectively, especially conflict-affected parts of the country where women are being excluded from democratic activities. Civil society organizations, such as PILDAT (Pakistan Institute of Legislative Development and Transparency), FAFEN (Free and Fair Election Network), Aurat Foundation, Pattan and more, have, over the last two election cycles, moved beyond campaigning to get women ID cards and registering them to vote. They now focus their work on training elected women to be effective representatives at the local, provincial and national levels so that they can be more accountable to the people they are meant to serve. The Election Commission of Pakistan data reveals that the gender gap between voters widened between the 2013 elections (10.97 million) to the start of 2015 local government elections when it grew to 11.65 million. Dr. Ali Cheema of IDEAS, and Dr. Shandana Mohmand of IDS hope to identify the obstacles to women’s participation and explore whether civil society interventions to enlist more women voters can be effective in reducing the gender gap in the upcoming elections. 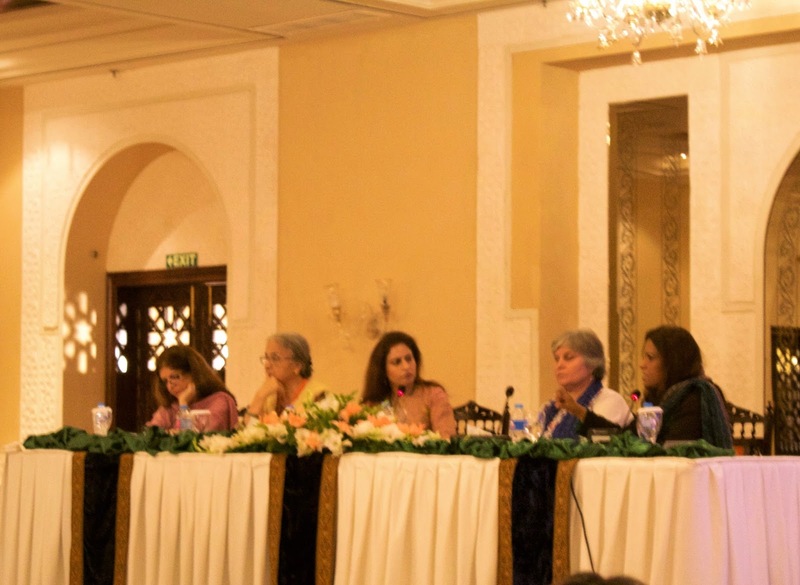 The A4EA launch brought together leaders of the women’s movement, such as Khawar Mumtaz and Tahira Abdullah who were deeply engaged in the struggle to restore reserved seats for women in Parliament. This struggle began as a demand of the Women’s Action Forum during the 1990s but was only realized in 2002. Reflecting on how far women have come since then during the panel discussion, Dr. Nafisa Shah, Pakistan People’s Party (PPP) MNA, and Bushra Gohar, senior vice-president of the Awami National Party (ANP), agreed that the time has now come to mainstream women’s political participation and expand affirmative action measures. This would mean advocating for political parties to include women in all of their central decision-making bodies, and commit to allocating a certain percentage of their tickets for general seats to women. Progressive measures such as these become complicated in the Pakistani context because women face extremist pressure that excludes them from the public sphere, particularly in areas most affected by Taliban elements. Unfortunately, mainstream political parties in certain constituencies have entered into tacit, and even written agreements with non-state actors to bar women from voting. This includes even avowedly liberal parties such as PPP and ANP. Panel participants agreed that the Election Commission of Pakistan, courts, and political parties had to play a more effective role to ensure this practice would not be repeated in the 2018 elections. Collective action is essential to bring together, and empower women’s voices in the political process. It has worked before – the women’s movement succeeded in getting the state to reinstate reserved seats, and women parliamentarians launched a new wave of progressive legislation when they worked together in the Parliamentary Women’s Caucus starting in 2004. Today, innovative civil society efforts are focusing on action at the local level, which is what CSSR will be examining more closely in its upcoming research. Bearing in mind Noam Chomsky’s advice that democracy starts effectively only after the elections, Dr. Yasmin Zaidi of the Center for Gender and Policy Studies initiated the AAN network, an innovative network-building initiative to enlist young college-going women in selected districts of the country to engage with their local “duty-bearers”, i.e. elected and government officials to ensure that their concerns are met. Begun in 2016, the AAN network has mobilized over one thousand women to work in local chapters to articulate their priorities and trained them in how to advocate so that the powers that be listen, and actually respond. The AAN network is now planning to develop a women’s charter of demands that it will take to political parties and local candidates, in effect consolidating and raising the volume of women’s voices in the electoral process. Even though progress sometimes seems slow and Pakistan’s transition to democracy falters often, its prospects don’t fail to engage women, even those living in conflict-affected areas. If and when they eventually find their full voice in the political process, who knows how far they can take the country towards a better future? Nice info about pakistani politics. Nawaz Sharif Doom is on the way.